In August of 1983, Bob Rockafield hired me to be a reporter for the Park Ridge Advocate, one of the weekly newspapers of Pioneer Press in suburban Chicago. When I walked into the newsroom for the first time, I had been a reporter for just over eight years, had worked for two small dailies in Canada and was deeply grateful, after two and a half years away from an actual job in the business, to sit back down in front of a typewriter and pick up a phone again, ready to talk to people, find out things and write stories so that readers could know what was going on in their town. I used a land line phone - a dial phone, if I recall correctly - and a manual typewriter. When I wrote my stories for my now long-gone editor, I used two carbons between three sheets of paper, so that I had a copy, my editor had a copy and the back shop had a copy so that they could set it into type. When I cut and pasted paragraphs I cut them with scissors and pasted them with glue (I can't remember it slowing me down any, but that's probably because I didn't notice how bad a writer I was back then.) I had to slow my daily-honed rhythms down to a slower pace, but that didn't take long. The slower pace allowed me time to become a better reporter and a better writer. In short, all was largely for me as it had been at my two previous papers. And as far as I was concerned, that was a good thing. I settled into my work as happily as a babe settles in at its mother's breast. I'd fallen into my profession by accident, but I loved it as much as that babe loves its mother. What mattered was that I was a reporter again. And here at Pioneer I've stayed, and stayed happily. I've rarely even looked for another position, save for a brief time when I tried to find work up in Minnesota. Thirty years, five separate papers, nine different editors, seven different owners (including one, Conrad Black, who gutted the company and its employees of millions of dollars and got, relatively speaking, a slap on the wrist and at least one book contract for it); six or so labor contract cycles, at least four of them as a member of the negotiating team. More than a handful of local, regional and national writing and reporting awards, I'm not too humble to mention, although it's been at least 15 years since I competed for such things. I'm still here, but the world has changed. I once more report on a daily, or near daily rhythm. The dial phone, the push-button phones that followed it, indeed the land line itself, has become a thing of the past. Few of my working compatriots would know how to cut and paste a story - or, indeed, how to slip two pieces of carbon paper between three sheets of cheap typing paper and put them into a manual typewriter. I have a laptop computer and a recently issued iPad; I have a smart-phone. I have wi-fi. I have a home office, one I've often preferred writing from, depending on who was in charge at Pioneer Galactic Headquarters. But I have no newsroom. My seventh set of owners decreed last December that all of their suburban properties would shut their physical doors this year. Those properties - Pioneer's weekly newspapers, some small outlying dailies - would continue publishing, but there was no longer any need for the physical plants, they said. The sole remaining physical plant would be in downtown Chicago, home of the Chicago Sun Times newspaper. Our editors would all report down there, whether their paper was in suburban Chicago, in Joliet, Waukegan or Gary, Indiana. The reporters, the photographers, we were cut loose, to report "from the field" or, if we were lucky to be assigned a beat close to our home, from a home office. In the weeks leading up to the closure of Pioneer's last office, a lot of things got thrown out. There simply is no room down at the Sun-Times for decades of bound volumes from almost three dozen weekly newspapers (some of which no longer publish), and several different dailies. 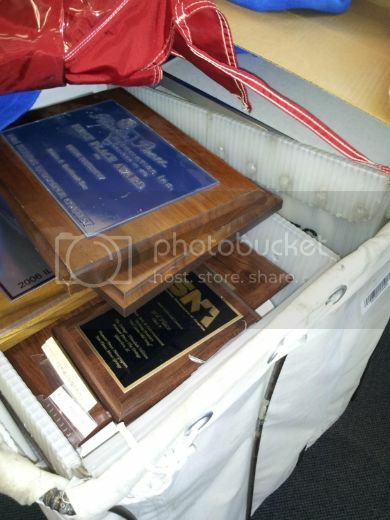 Nor is there room for decades of local, regional and national award plaques, given to decades of gifted reporters, photographers, designers and even dedicated advertising folks. No room, and less interest. I'll go on. But I am so very weary, and sorry, and sad. This entry was originally posted at http://kaffyr.dreamwidth.org/253592.html?mode=reply, where there are currently comments. You can comment there or here; I watch both. It's surreal and sad by turns. Half the time I can't believe it's happened, even though I think I prepared for it better than some of my colleagues.